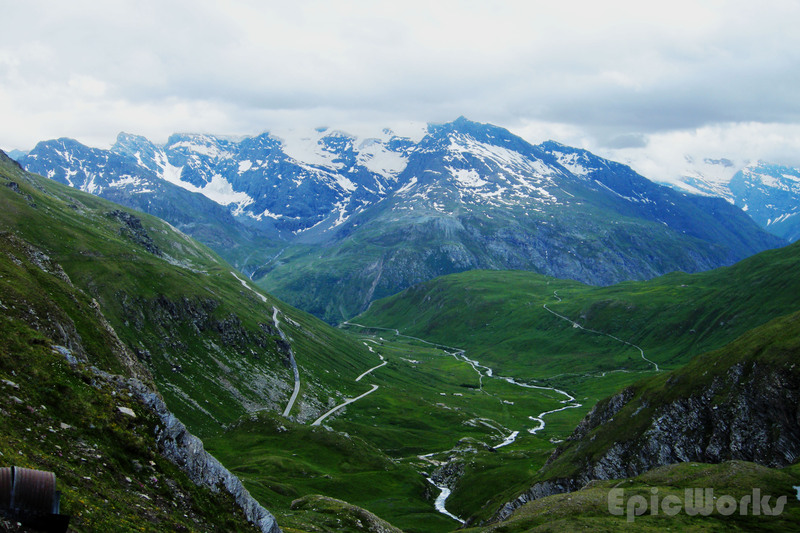 The longest ascent in the Alps. The highest col in France. This was to be the start of my second ever long bike ride, my first ever two day trip. I’d been told to pack light, so I was only carrying some food, my winter cycling jersey, a rain jacket and a spare tyre. Oh, and my keys and phone. That was it. No spare clothes. No toothbrush. No amenities. I turns out it was a good call, as any more weight and I probably wouldn’t have made it to our destination on the Italian side. After an early morning train to Saint Maurice we set off towards Iseran. 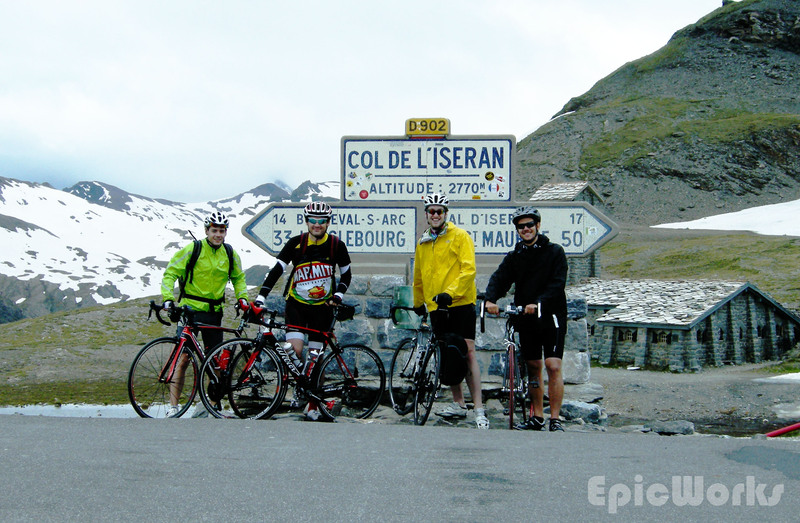 The ride up is long and smooth, and goes pas quite a few of the famous ski stations: Tignes, Val d’Isere or la Rosière to name some. Although it was quite cloudy, you could just see some glaciers way up on the sides of Mont Pourri, the serracs poking out from the mist. 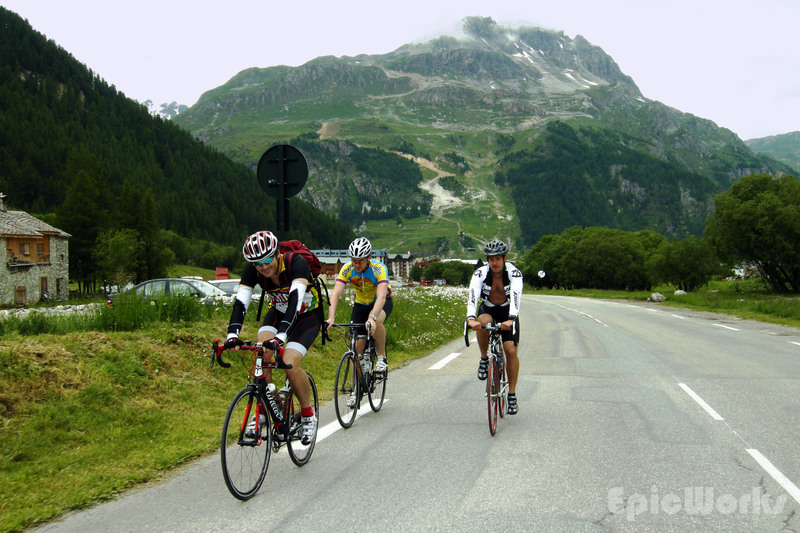 The real ride opens up after Val d’Isere, as the valleys become wider and much more alpine. The road gets smaller and offers a clearer view. As we went up the winding road we could see more and more snow-capped mountains. As I slowed down for the final set of curves, the temperature dropped too. Although much better, I was still worried about my knee, never quite sure if it would suddenly blow out. But with M pushing me on, I finally rode up to the sign indicating the highest col in France. Not bad! A quick coffee and we were off! After a few seconds of agony due to the cold, came the bliss of flying down a twisting mountain road. The view was incredible, and the route, having no fence except high grass, gave a stunning sensation of speed. It always amazes me how long that descent can take, taking into account the speed at which you can roll. Slowly the temperature increased and we were in the valley again. Past Bonneval-sur-Arc, and along a flat stretch toward the next climb. Here, with a very slight downwards slope, we took turns in front of the speed train, pushing the wind out of the way. 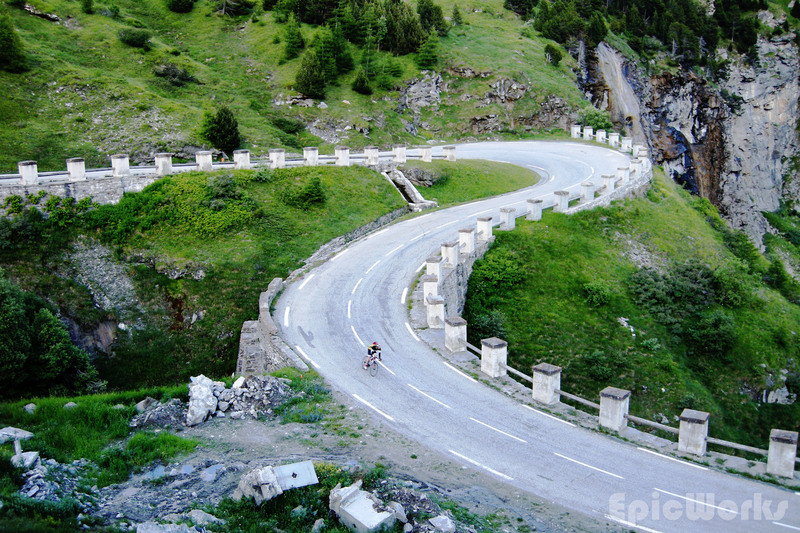 The next climb, up towards the col de Mont Cenis is quite simple and short, zig-zagging up several hundred metres. I say it is simple because on the map it looks so. By this point the first climb was telling and really had to concentrate. Until now I hadn’t dared to cycle upright due to my knee, but here I had too, just to keep up the rhythm. By steadily counting my strokes and alternating sitting and upright position I got to the top. A small sculpture with elephants commemorates the passage of Hannibal over the Alps. Having since checked up on the matter, I found it is now considered possible but not probable this was the col the Carthaginian used. It is truly beautiful and the road runs along the lake. Slowly, it begins to drop, going down towards Italy. As we picked up speed, it suddenly felt like we ridding on silk: we had crossed the frontier! With brand new asphalt all the way to Susa, we made good time.